Keystone Wood Specialties is one of only ten Pennsylvania employers honored with this year’s 2009 Governor’s Award for Safety Excellence, which was presented on October 19th during the 83rd Governor’s Occupational Safety and Health Conference at the Hershey Lodge and Convention Center in Hershey Pennsylvania. This is the culmination of several year’s work by Safety / Compliance Coordinator Dave Landis. Applicants for the Governor’s Award for Safety Excellence must meet rigorous standards of achievement. 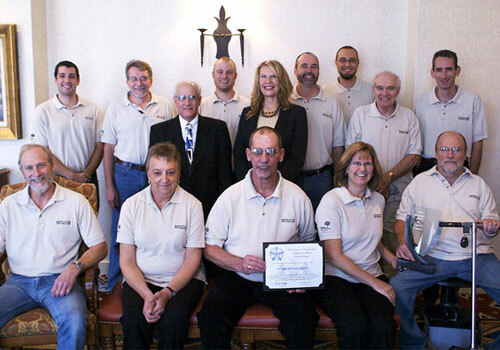 The award recognizes successful employer-employee safety programs that produce tangible safety improvements. Keystone Wood Specialties was founded in 1972 as the S.D. Stoltzfus Cabinet Shop. The manufacturer of custom cabinet doors, dovetailed drawer boxes, moldings and other custom components, has made significant investment in new technology to increase workplace safety and productivity.